Like many collectors, I'm finding that today's economic challenges are making it more difficult to do all the buying I would like. That's why I'm so happy to discover more and more collectors, dealers, and toymakers are exploring the possibilities of toy trading. A couple of weeks ago, Michelle Mutschler, a wonderful teddy bear artist from Canada, discovered my blog as she was searching for information on antique British teddy bears. 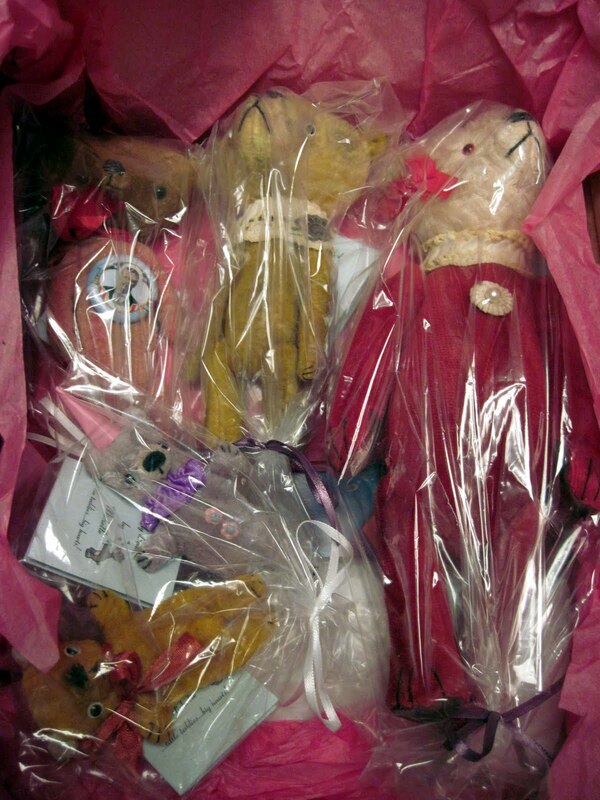 I offered her a couple of my vintage bears, she offered me some of her handmade teds, and quick as a flash, two packages full of bears (and surprises!) were making their way through the international postal system. My box of bliss arrived last night, with the contents beautifully wrapped. 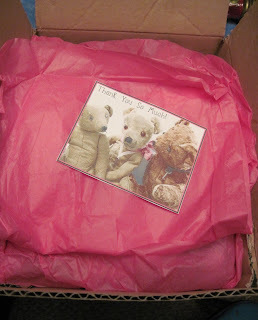 And look what was under all that enticing pink paper: five fantastic little bears! The tiniest two, in the lower left corner, are only three and a half inches tall, while the largest, in the upper right, is nine. 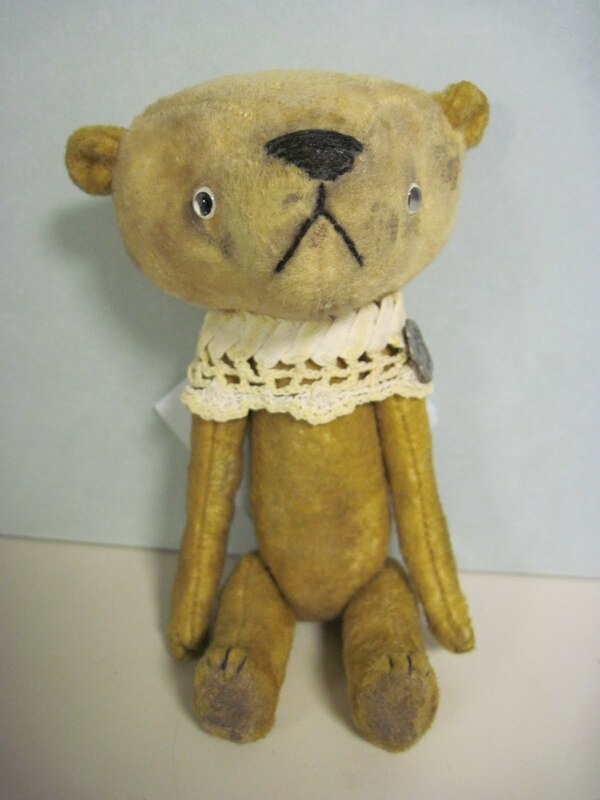 Michelle's bears are made of vintage and aged mohair, velvet, and velveteen, and comprise a wide range of characters, from comical, carnival inspired clowns to primitives and antique-look bruins. 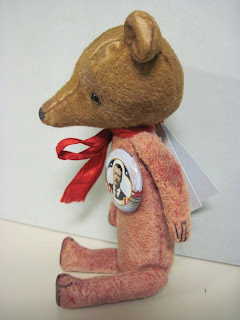 Here are the tiniest teds, "My Old Bear" and "Flora," unjointed itty bitty pocket bears. 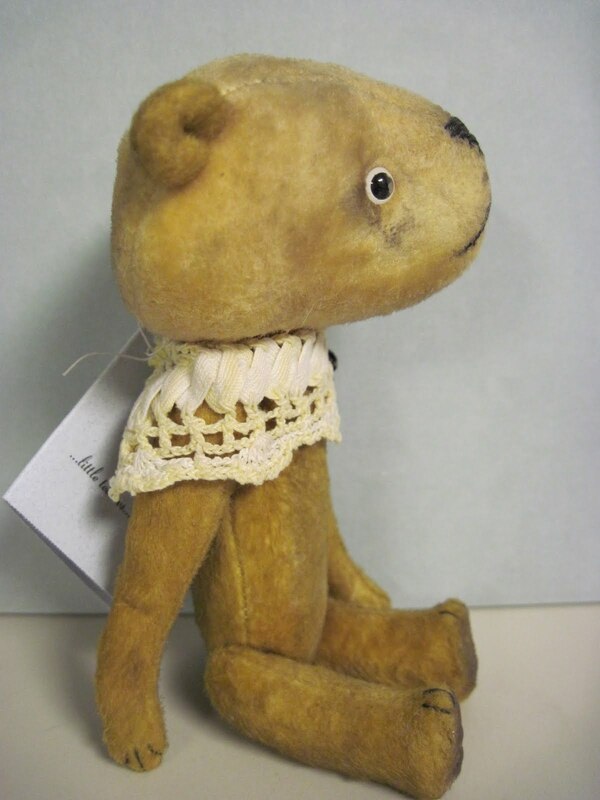 "Martha" is a dotty looking, primitive style bear made of two-tone velveteen wearing a lace doily collar. Martha has rather a prodigious schnoz. 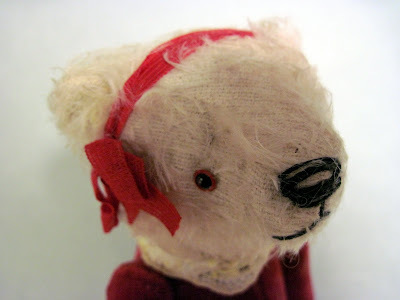 The other bears try not to stare, as she's rather sensitive about it. 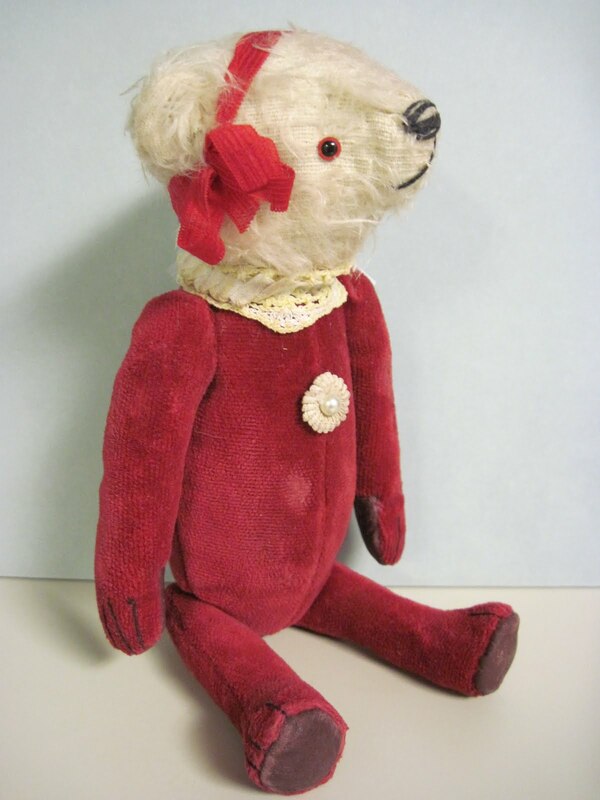 "Grizelda", made of vintage white mohair and red velvet, reminds me of antique clown and harlequin bears. Such a sweet face on this one...don't you just want to kiss that nose?! 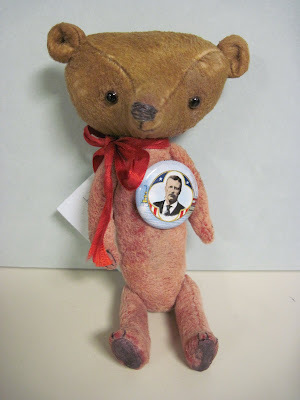 And last but not least, "Ted E." has one of the craziest heads I've ever seen on a bear. Just look at that profile! Thanks sooooooo much, Michelle, for your fab teds! I'm so flattered!!! Thank you Tracy and I'm so glad you enjoy them! I'm happy they have found a good HUG to be part of! I LOVE them! 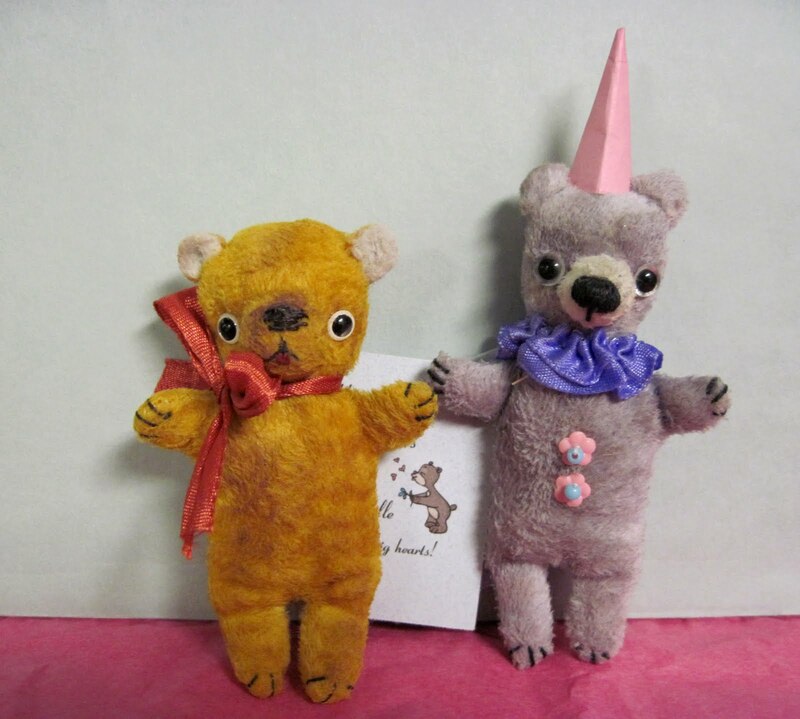 Awesome, spectacular little bears! Ohhh, I love these bears. Martha's schnoz is just the best ever. Ted E. is pretty special too. I recieved a bear from Michelle to today! He is soo pretty!